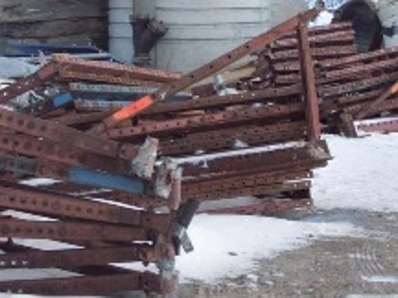 C89L Bridge Overhang Brackets are in good condition and at a good price. Reach us to discuss further. C-89-L Bridge Overhang Bracket 1389 Ea. C-89-L Heavy Duty Bridge Overhang Brackets have an 8,000 lb. capacity and a 90" horizontal member. C89L Heavy Duty Overhang Bracket are designed for maximum adjustment and strength to meet most heavy cantilever formwork projects. The C-89L Overhang bracket features 72" long, four inch horizontal channels and an overall vertical adjustment range of 27 5/8" to 66 3/4". The C-89-L overhang bracket has 90" long, six inch horizontal channels and an overall bridge overhang brackets vertical adjustment of 29 5/8" to 68 3/4". C89L overhang brackets come equipped with nail holes in the top of the horizontal bridge brackets channels for attaching lumber. Overhang brackets have built-in guardrail receptacles for 2x4 guardrail posts. The bracket can be easily and quickly preset on the ground and then set in place as needed. The C-89 and C-89-L brackets can be used equally well on steel or precast concrete bridge girders. C-89L brackets can be knocked down for easier handling of the bridge overhang brackets and then preset on the ground at the job site. The C-89-L Heavy Duty Bridge Overhang Bracket is designed for maximum adjustment and strength to meet most overhang formwork requirements. C89L Overhang brackets are usually adjusted to proper grade during the normal dry run operation of Concrete Formwork. 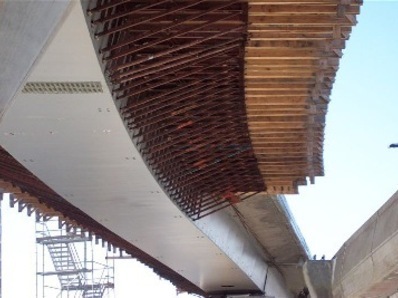 Typically, the C-89-L overhang forms are set 1/4 inch to 3/8 inch above finished grade to compensate for dead load deflection during Concrete Formwork. Bridge Overhang Bracket C-89-L Dayton Superior Concrete C89L Heavy Duty Bridge Overhang Brackets are designed for the rigors of heavy cantilever and or overhang applications. The C89-L bracket features 72" long, four inch horizontal channels and an overall vertical adjustment range of 27-5/8" to 66-3/4. The Dayton Superior C89L bracket has 90" long, six inch horizontal channels and an overall vertical adjustment of 29-5/8" to 68-3/4". C-89-L brackets come equipped with nail holes in the top of the horizontal channels for attaching flat lumber to the brackets. The Dayton C89L brackets can be used equally well on steel or precast concrete bridge girders with the appropriate 3/4" C60 45 degree Pres-Steel Hanger. The C-89L brackets can be shipped knocked down for easier handling and shipping and then preset on the ground at the job site. The C-89-L and can be utilized on either steel or concrete girders using the appropriate 3/4" exterior hanger, such as the C-68 Type 9AB Ty-Down hanger. C89L brackets are fabricated with nail holes in the top of the horizontal member for securing the required lumber nailer to the Superior bracket. Either a 6x2 or an 8x2 lumber member may be used as the nailer for the C-89L Dayton Superior Concrete bridge overhang brackets. A guardrail receptacle, which allows for attaching a 2x4 guard rail post, is built into the outboard end of the C-89L brackets horizontal member. An outboard adjustment nut controls the vertical movement of the outboard end of the bracket to accommodate setting the overhang formwork to final grade.